The University of California, in 1913, created a new division – Agricultural Extension – in preparation for federal funding that would become available in 1914 through the Smith-Lever Act (federal law that established services connected to land-grant universities to inform citizens about current developments in agriculture and home economics and other matters). …Are there certain places where it's simply too dangerous to build? It's a simple question, but politically charged. Land use — deciding where to build — has long been the domain of cities and counties. It's a responsibility local governments doggedly guard. Two national research teams led by scientists at Washington State University (WSU) are on a mission to protect U.S. grape, onion, and garlic crops from deadly, fast-adapting pests and diseases. And thanks to more than $5 million in Specialty Crop Research Initiative (SCRI) grants from USDA's National Institute of Food and Agriculture, they are off and running. …SCRI funding will support four years of research, and three separate research components, spearheaded by WSU, USDA's Agricultural Research Service (ARS), New Mexico State University, Oregon State University, Cornell University, College of Idaho, and University of California's Division of Agriculture and Natural Resources. …Last year's disasters reopened questions about local notice requirements. In Houston, some people lived inside a “flood pool”, an area used for emergency inundation, but beyond the boundaries of the floodplain itself. They now argue that the government should have told them about the risk. In August, California's governor, Jerry Brown, signed a bill requiring insurers to give homeowners a replacement cost estimate for loss in case of disaster. From almond milk to almond butter to the wasabi-seasoned nut itself, consumers are eating more almonds than ever. California's dry, hot weather and access to quality irrigation water makes the state a top producer of the craved nut. After a four-year drought, California's almond harvest is back on track reaching record levels. But smart growers continue to look for ways to keep production streamlined and efficient. …Regardless of these contrasting consequences for key California products, the proposal is consistent with FDA labeling regulations designed to prevent misleading consumers. For example, it is not legal to label plant products as being “cholesterol free,” because plants don't produce cholesterol. All plant products are cholesterol free, so it is misleading to label some of them that way, as it implies that other plant products not labeled as cholesterol free might contain the compound. At a minimum, advertising a plant product as being cholesterol free implies that some plant products do contain cholesterol, which is false. Butte County is about to buy a building in Chico that many people probably think it already owns. … Then after a remodeling estimated to cost $139,500, the county Agriculture Department and UC Cooperative Extension office will move into the vacated space at the county center. The PubScience lecture series grew out of an initiative at UC Berkeley called the Communication, Literacy and Education for Agricultural Research (CLEAR) project. It started three years ago with a $103,000 grant from the University of California Global Food Initiative and has grown to encompass four areas of student outreach: on campus, in the classroom, in government, and in the community. UC Berkeley researcher and outreach specialist Peggy Lemaux launched the program in 2015. She says it's important for the public to understand why science is important, and having young scientists connect with regular folks in the community advances that goal. “If we're not telling people about what we're doing and why they should care, then it's going to be really easy to cut funding for science,” Lemaux said. … The roots of that cup of coffee started in 2002 when Dr. Mark Gaskell, then a farm advisor with the University of California's Cooperative Extension, came to Ruskey with an unusual suggestion. Try growing coffee. …Some commentators point to declining enrollment in many universities' humanities and social sciences programs as evidence that higher education in the future will be dominated by STEM subjects, such as business and economics, as students seek degrees that will lead to better employment. If this is the case, I can think of no more practical application of science and technology than occurs in the agriculture departments of land grant colleges, including the University of California. In fact, it's not an overstatement to say the vast network of Cooperative Extension offices and research facilities operated by the UC has enabled agriculture in the Golden State to survive amid daunting challenges. Drought? The UC is developing soil maintenance strategies, conducting groundwater recharge trials, and giving growers updated evapotranspiration information so they can manage water stress in trees. Labor shortages? The UC is working on numerous automation projects. So-called assassin bugs are often the heroes of an orchard, preying on other insects and keeping pest pressures under control. But as many a grower will tell you, when they bite, it often stings — a lot. Ben Faber, University of California Cooperative Extension advisor based at Ventura, tells of the call he got recently from a grower asking about an insect that had bit him when he picked it up. The bite had caused fearsome pain and some swelling. …Dr. Jhalendra Rijal, University of California integrated pest management (IPM) advisor, is looking at various discoveries of PFB in walnuts near the community of Farmington, gathering information for what could become a multi-year study. Vegetative growth of almond trees has two main components, UC Cooperative Extension advisors Elizabeth Fichtner and Bruce Lampinen explain. They are vegetative shoot growth, which provides the overall architecture of the canopy, and spur production, which generates the tissues that give rise to fruit in subsequent season. As the California Citrus Research Board celebrates its 50th anniversary, it has had no closer partner than the University of California. Beth Grafton-Cardwell, director of the UC Lindcove Research and Extension Center in the foothills above Visalia, Calif., has seen lots of changes since arriving at the center in 1990. “When I first started, to estimate the yield of a tree we had to manually count the fruit,” she says. Now, citrus fruit is placed in bins that go through a packing line with a Compac fruit grading system that measures weights, sizes, shape, color, and even sugar content. Necessity may be the mother of invention, but research is its facilitator. And that's what the Turf Program at UC Riverside celebrates at the school's annual Turfgrass and Landscape Research Field Day every September, when golf industry professionals from various quarters gather to review the progress of the “inventions” necessity has dictated, and the game's fortunes have financed. … That's why the SCGA joins the USGA, the state's various GCSAA and PGA Chapters, and a vast array of commercial entities in making annual contributions to the UCR Turf Program. Whether the subject is water footprint reduction, drought tolerant species, disease resistant strains, insect impervious strains, water restrictive protocols, irrigation efficiency, salinity tolerant grasses, wetting agents or any of the scores of developments that have in the past and can in the future assist the golf industry to remain viable in an increasingly difficult regulatory and cost consumptive environment, there is no better investment in that future than the kind of practical research Dr. Jim Baird and his team at UC Riverside engage in. Stanislaus County is joining the Master Gardener program, which trains volunteers to share their knowledge about how to grow stuff. …The program is part of the University of California Cooperative Extension, which has an office off Crows Landing Road west of Ceres. Almost all of the state's 58 counties have joined Master Gardener since its 1981 launch. Dr. Randall “Cass” Mutters, second from right, retired UC Cooperative Extension farm advisor and country director, was awarded the California Rice Industry Award at the Rice Field Day on Aug. 29. UC Rice Specialist Dr. Bruce Linquist, second from left, made the presentation on behalf of the California Rice Research Foundation with Chairman Gary Enos, left, and Rice Experiment Director Dr. Kent McKenzie, right. …The fate of recipes will vary, because each ingredient responds differently to the many influences of climate change, according to Tapan B. Pathak of UC Merced's Division of Agricultural and Natural Resources. “Increases in temperature, higher variability in precipitation trends, increased frequency and intensity of extreme events such as drought, heat waves, and floods are expected to impact agriculture in California,” said Pathak, whose research on the impact of climate on California's $50 million agricultural market recently was published in the journal Agronomy. A new wave of genetic technologies may one day provide ‘artificial insemination on legs' for the beef industry, a visiting US extension specialist told a University of Queensland audience recently. Extension specialist Professor Alison Van Eenennaam, from the University of California's Department of Animal Science, spoke to a University of Queensland audience last month. …“Maybe it's a coincidence” that the Delta, Hirz and Carr fires have all ignited in a cluster, making for one of the worst fire seasons Shasta County has seen in decades, said Scott Stephens, a fire sciences professor at UC Berkeley. Or maybe it has to do with the fact that it's a heavily forested rural area, broken in some parts only by highways, which makes it so that vehicle sparks are dangerously close to fuel, he said. Stephens said the fires appear to all be human-caused accidents that just happened to ignite in the same area. The Carr fire, which burned 229,651 acres and killed at least seven people, was started by a vehicle's flat tire, and Stephens suspects the cause of the Delta fire was also transportation-related. 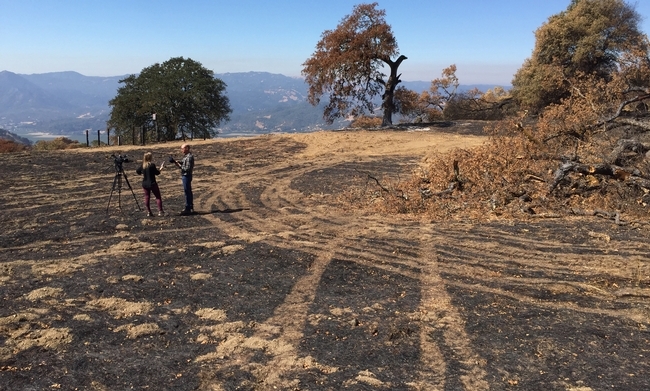 Sara Stinson of KRON4 News interviewed John Bailey about the impact of the River Fire on UC Hopland REC. It's been one month since the Mendocino Complex Fire erupted, the largest wildfire in California history. On Thursday night, KRON4 has an exclusive look at some of the devastation and what's ahead. A more than six decades old University of California research center was among thousands of acres of land destroyed. KRON4's Sara Stinson shows that scientists are turning the loss into something positive. Watch the video to see Sara's full report. As growers have been irrigating their almond orchards in preparation for harvest, some may have been unnerved by the appearance of pale or yellow leaves in their canopies. This is often the result of chlorosis, a condition in which leaves produce insufficient chlorophyll, which gives them their green color. A trio of University of California Cooperative Extension advisors suggests the cause may have something to do with irrigation decisions made in the orchard. How Are This Year's Wildfires Impacting Specialty Crops? …Yield will probably not be affected, says Margaret Shake Lloyd, Small Farms Advisor, University of California Cooperative Extension. Sunburn is an issue in the area, so smoke problems are balanced out by less sunburn. But those crops that have sunburn may give growers some headaches. …So Morris gladly allowed his ranch to be one of two sites that UC-Davis and UC Cooperative Extension scientists used to flood established alfalfa stands with storm water during the winters of 2015 and 2016. The study's initial results were published earlier this year in the UC's journal California Agriculture, asserting that alfalfa can tolerate very heavy winter flooding for groundwater recharge.